With the fund-raising done, focus now turns to the challenge for this year – four 100mile + rides. The first two are back to back (kind of!). Next Saturday is the Tour de Type 1 and then on the following Sunday L’Eroica Britannia. I always think I could be doing more, but what is done is done now! 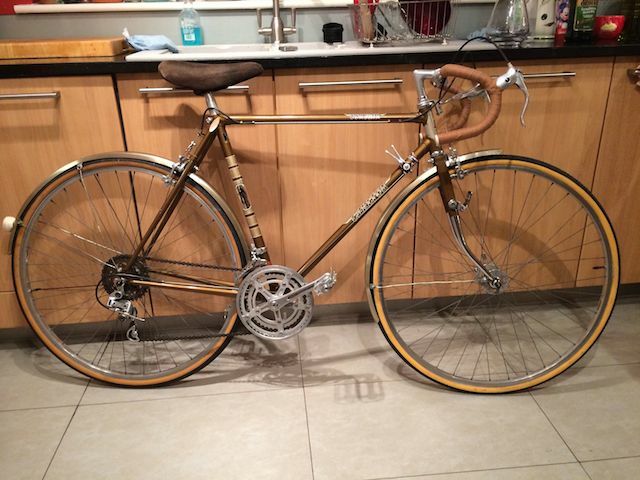 For those who have been following the details, two of the rides (both L’Eroica’s) will be done on a classic 70’s bike a Carlton Corsair. Carlton Cycles were made just down the road in Worksop, originally as an independent company, and then as part of the Raleigh bike company, until they went bust in 1982. Some of the guys who worked at the factory building these bikes are still part of the local bike scene, including Dave Marsh at Universal Cycles in Maltby. I picked this restored bike up on eBay before Christmas, and have ridden it a couple of times to shake it down – it feels pretty good. However, I thought there could only be one person to give it a proper service before riding it in earnest, so dropped it off with Dave last week. With that bike being prepared for one half of the challenge, attention turns to the other pair of rides. They aren’t to be done on a classic bike, but a ‘normal’ road bike. However, my current road bike is long in the tooth, and more importantly, not really set up for the hills of the first ride – 131 miles through the Yorkshire Dales. Until now, I’ve never bought a PROPER new bike. I have built up quite a collection, but mostly second hand ones from eBay, either bought whole or built from parts. I always promised myself that if I stuck with this road cycling lark, I’d invest in something at some point. With this in mind, I ordered my first new bike last month with local Trek dealer Don Valley Cycles, and got a phone call yesterday….! More of which to follow….! previous post: Curesam Rocks – again! || next post: Choose your weapon…. Good luck with the rides this year Gareth, I keep calling by to se what you are upto. The Carlton looks nice, I had one back in the 1960’s myself. Look forard to hearing about the new bike! Thanks for your kind words, Robin – hope you are well too and still enjoying the riding!